And how should ye not eat of that over which the name of Allah hath been mentioned, when He hath explained unto you that which is forbidden unto you unless ye are compelled thereto. And lo! Many lead (others) astray by their own lusts through ignorance. Lo! Thy Lord, He is Best Aware of the transgressors. Wa maa lakum ‘allaa ta’-kuluu mimmaa zukiras-mUllaahi ‘alayhi wa qad fassala lakum-maa harrama ‘alay-kum ‘illaa maztu-rirtum ‘ilayh. Wa ‘inna kasii-ral-la-yuzil-luuna bi-‘ahwaaaa-‘ihim bi-gayri ‘ilm. ‘Inna Rabbaka Huwa ‘a’-lamu bil-mu’-tadiin. ‘Allaa – actually it is a collection of two words – ‘an (that), and laa (no, not). These two words were joined by tashdiid (‘allaa for ‘an-laa), so it doesn’t come in speaking. After that, it was left in writing too. ‘Aztu-rirtum – (you are compelled), it is the tense of passive voice. This word is from ‘iztaraar, which has been derived from zarrun. Zarr means “poverty, hardness, helplessness, powerlessness etc.” ‘Iztaraar means “to fall in the tightness, where someone becomes helpless from all sides”. ‘Al-mu’-tadiin – it is plural of the subject mu’-tadii, which has been made from ‘a’-tadaa-‘un. The word ‘A’-tadaa-‘un has been derived from ‘adwaan, which means “rebellion, defiance, refractoriness, oppression etc.” ‘A’-tadaa’ means to rebel, to oppress, that is to say; to cross the limits in any field, to disobey and to oppose the law. It has been stated that maximum people in the world have been slaves of their wishes and they desire to carry on others too according to those wishes. You must not come in their outward artificial things. Moreover, you should abide by the Instructions mentioned in the Holy Quran and eat the meat of that lawful animal, over which the name of Allah has been mentioned. It has been explained more clearly in this verse that these slaughtered animals should be those, which have not been forbidden for you. It is commanded that you were told heretofore clearly about the things, which are unlawful for you. You should not eat them except in that condition, when you are near to die without eating. The words used in the Holy Quran for this purpose are ‘illaa maztu-rirtum ‘ilayh (unless you are compelled thereto). Instead of it, you should eat fondly the meat of that lawful animal, over which the name of Allah has been mentioned. The meat of that lawful animal is also lawful for eating, over which the name of Allah Almighty has been mentioned during slaughtering by anyone at the time of its death. 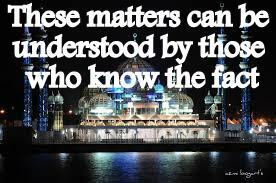 These matters can be understood by those people only who have knowledge of the reality. Whereas, these people are transgressors and Allah Almighty is Best Aware of them. 117. Lo! Thy Lord, He knoweth best who erreth from His Way; and He knoweth best (who are) the rightly guided. 118. Therefore eat of that over which the name of Allah hath been mentioned, if ye are Believers in His Revelations. 117. ‘Inna Rabbaka Huwa ‘a’-lamu many-yazillu ‘an- SabiiliH. Wa Huwa ‘a’-lamu bil-Muhtadiin. 118. Fa-kuluu mimmaa zukiras-mUllaahi ‘alayhi ‘in- kuntum- bi- ‘AayaatiHii Mu’-miniin. At that time, when Holy Qur’an was revealed, nearly entire people of the world had gone back from the Way of Allah Almighty. When the Messenger of Allah Almighty began to explain the real Revelations of Noble Qur’an, it was very troublesome for them to give up their wrong path, because being too much habitual of it; they had seen their own death in this new system and organization, whereas the secret of real life was hidden in it. The people of Makkah used to criticize the commands of Holy Qur’an. Instead of understanding the actual matter, their only job was to object. The Commentators have explained that when the Holy Qur’an forbade from eating the meat of any dead animal dying naturally and determined it unlawful for eating, hereupon, the infidels of Makkah turned up their nose and knitted the eyebrows according to their habit, and from them, those people, who used to consider themselves more wise, they said: it is strange that the animal, which is killed by Allah, is unlawful for eating, whereas, which is slaughtered by a mankind himself, is lawful. It was described in the previous verses for warning as its preface and reply that those people, who mislead from the Way of Allah, say about the apparent matter by making reform. But there is nothing in their fraudulent sayings. The fact is that Lawful and Unlawful is based on the Command of Allah Almighty. The actual foundation of their objection is that they consider that Allah Almighty should be bound of their wishes, and as their idols say them nothing, they do as they desire, likewise Allah Almighty should not give them order (Let’s flee to God). False foundation of their thoughts was disclosed in the previous verses. It has been described very clearly in this verse that “to order is just the job of Allah Almighty and to obey His Command is the duty of entire mankind”. It is commanded that Allah Almighty knows best them, who err from His Way, as well as them also, who are rightly guided and go straight forward on His prescribed Way. Erroneous way cannot be correct due to their false and destructive ideas. The wrong is always wrong. Therefore, you should not care of the sayings by the stupid people. It is wrong to say that the animal, which dies itself, is killed by Allah Almighty and which is slaughtered according to the instructions of Allah Almighty, is killed by the human being. Allah Almighty kills every soul, whether that is from the mankind or animal kind. Moreover, because the name of Allah Almighty is mentioned at the time of slaughtering any lawful animal, so due to the blessing of His name, it becomes lawful for eating the meat of that particular animal only. Accordingly, if any animal is slaughtered by mentioning the name of any other than Allah Almighty, that is unlawful too, whether that is slaughtered in accord with the prescribed instructions. 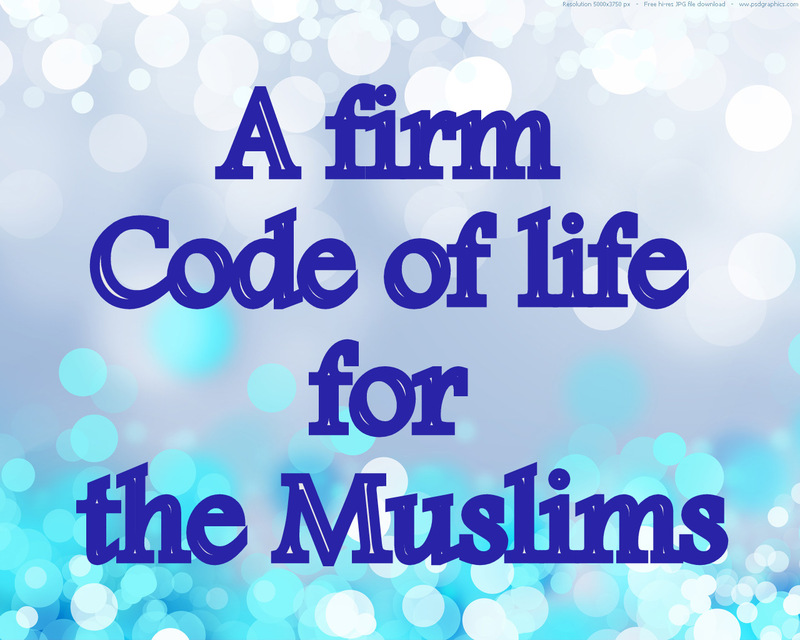 For this reason, being lawful is only with the name of Allah Almighty and His command. And if thou obey most of those on earth they will mislead thee far from Allah’s Way. They follow naught but an opinion, and they do but guess. Wa ‘in- tuti’ ‘aksara man fil-‘arzi yuzil-luuka ‘an- SabiiLIllaah. ‘Iny-yattabi-‘uuna ‘illaz-zanna wa ‘in hum ‘illaa yakh-rusuun. A formula for passing a successful life in this world has been signified in this verse for the Muslims. If the believers will act upon this formula, neither they will ever fail and nor go astray from the Straight Path. This Speech is for the Messenger of Allaah Almighty (grace, glory, blessings and peace be upon Him), whereas the lesson, hidden in it, is being taught to the entire nation. This is such lesson, which will be a firm Code of Life for the Muslims in each condition and time till the Day of Judgment. If ever, they gave up acting upon it (God forbid), then they will live in the middle of nowhere and their national existence will be wiped out like invalid character. It can be understood clearly from this verse that the Muslims should never turn away even a hair’s breadth from SabiiLIllaah i.e. the Path of God Almighty. It is necessary for every Muslim to understand first that the mankind is a passenger in the world. Coming in the world means that the human being has stood out from his home and native country. Now he has to finish this journey by way destination. The end of this journey is “Death”. Death means; it is the end of this world’s journey and the mankind has arrived at his residence. From birth to death, he has to cross over a very long and wide field. The name of this field is ‘the world’. After death, he will enter in his home country. Name of that home country is “the Doomsday, the next world”. At first, he will have to pass through the stages of “the Grave, the General Resurrection, the Lamentation, reckoning of Accounts, the Bridge over which the righteous will pass to Heaven, and the sinner and evildoer will drop into the Fire of Hell”. Then he will reach his home, which will be either Paradise or Hell. The Paradise is the place of comfort, whereas the Hell is the place of restlessness. If the human being desires to reach direct to the Paradise, then a Path has been fixed for him in the world. This Path has been prescribed by Allah Almighty and for its acquaintance; He has sent His Messenger (grace, glory, blessings and peace be upon Him) with His last Word “Holy Qur’an”. The meaning of going astray from this Path is that the humankind left the Straight Path and entered in the dark forest. Now he doesn’t know; whether he will die; being entangled in the thorny bushes and trees or in any marsh, and what will happen with him in the next stages of death, and what will be exposed to imminent danger in the Hell. The Straight Path is called “Siraatal-Mustaqiim, SiraatAllaah and Siraatul-‘Ambi-yaa (the Path of Prophets – peace be upon Them)”. Who will escape in the world from swamps, abysses and confusions, will be easy at the time of death, the stages of general resurrection will be finalized easily, and a ready-made, comfortable home will be handed over in the Paradise duly prepared in all respect for living. This Path can be chosen only by acting upon the Revelations of Noble Qur’an. There are many enemies of the human being, who call towards fulfilling of the worldly desires without any resistance to seduce him/her. Whereas; Holy Qur’an commands: Do in accord with My Instructions giving up your own wishes. Stop there, wherever I prevent you. Actual enemy of the humankind is Satan (the Devil), who calls them towards the worldly desires to be completed unchecked, and maximum people of the world follow Satan leaving Qur’an. Therefore, the Messenger of Allah Almighty (grace, glory, blessings and peace be upon Him) has been admonished in this verse including entire human beings and particularly Muslim Nation through Him, that there are a lot of devils in the world. You should hold the Noble Qur’an firmly and not obey the devils. ‘In- – this word has come three times in this verse. First time it means “if”. Second and third time it has been used for the meaning “no, not”. These two types of this word’s meanings must be remembered. It comes often for the meaning “if”, but sometimes it is used for the meaning “no and not”. Yakh-rusuun – (they form an opinion), it has been derived from the word kharas, which means “to guess and to say something with rough estimate. 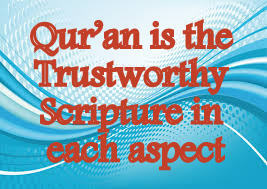 It was told about Holy Qur’an in the previous verses that It is the Word of Allah Almighty. Neither there is any doubt in it and nor any person has any authority to make any kind of change in It. One more fact has been cleared in this verse and the importance of Holy Qur’an has been proved. If, It is understood thoroughly then all the disputes of the life end, the course of life can be passed with comfort and ease in this world as well as the perpetual pleasures and rest of the Hereafter can be attained too. The matter to cause to know is that, there are mostly such people, who cannot say surely anything in the world. They affect their purpose by means of judgment and suspicion only. 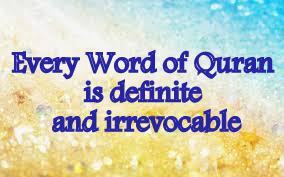 While, contrary to it, every Word of the Holy Qur’an is definite and irrevocable. If giving It up, other people are obeyed then a person will never obtain anything but error and depravity. It is commanded: You will see most of such people in the world. if you will abide by their instructions, you will go astray from the correct path, because their sayings are not certain, but are based only upon their guess and opinion. Whereas, it is not possible to go Straight Way by conjecture, but the worldly matters are also performed clumsily, and suppose: if some of those have been corrected anyhow, then have been corrected after a long time and the experience of the years, while it would be proved that the conjecture or guess was right or wrong. Then it would be either done with confidence and wholeheartedly or left. After concentrating a little bit, it can be understood that if the Prophets and Messengers of Allah Almighty (peace be upon Them) had neither come in the world, nor told the certain matters to the humankind, then the human being would not have been able to be civilized so early as he seems now, because he would have to follow the supposition and conjecture, and at that very stage, he would have used to wander until he would not have known certainly through experience of everything, upon which, the foundation of social relationship and morality has been established. It was the duty of Prophets and Messengers (peace be upon Them) that they would have to bring the Scripture of Allah Almighty and tell the mankind about entire those certain matters, which are the source of his permanent improvement and correction. And Perfected is the Word of Thy Lord in truth and justice. There is naught that can change His Words. And He is the Hearer, the Knower. Wa Tammat Kalimatu Rabbika sidqanw-wa ‘adlaa. Laa mubaddila li-Kalmaa-tih. Wa Huwas-Samii-‘ul-‘Aliim. ‘Adl – (justice), it means “equality”, that is to say, such word or command, in which, there is neither any loss for anyone nor anyone is oppressed. It is the Word of that One, Who is Lord of everything. Therefore, He is Lord of humankind also, and the civilization of human beings comes under His responsibility too. The civilization means “to fulfill all requirements of anything and bring it up to the stage of its perfection gradually”. It was necessary for the training of human being that he was to be provided with the clear Light of Guidance to enlighten his wisdom. That light is this Noble Qur’an. As the sun is the source of light for the apparent eyes, likewise, this Holy Qur’an is the source of the Light for the inner eyes. Everything in It is according to the incidents. Every person will live safe from the tyranny and oppression, if he abides by Its Rules. None can make any change in It. Its Sender is the Hearer of everyone, the Commander of every situation and the Knower of every that matter, which is hidden in the hearts. It is commanded that This Word is from your Lord, Who is the Lord of the entire world too. It has been filled with the Truth, so full care has been taken in It to avoid any loss. None has any power to change any Word of It. You do not need to listen to any other than believers and are seduced. Ask Your Lord, whatever You have to ask. He is the Hearer of everyone. The people, who are around You for misguiding, do not know anything about the incidents. And the One (God Almighty), Who inspired This Holy Qur’an for Your guidance, He knows everything. These people cannot tell you that, which thing is advantageous for you, because they do not know that, what is useful for the humankind and what is harmful and dangerous. The biggest proof of their ignorance and stupidity is that, they have been running behind the casual relishes and have considered this world everything. 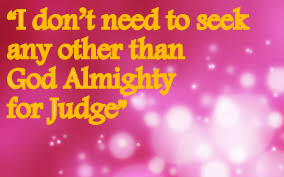 Shall I seek other than Allah for judge, when He it is Who hath revealed unto you (this) Scripture, fully explained? Those unto whom We gave the Scripture (aforetime) know that it is revealed from thy Lord in truth. So be not thou (O Muhammad) of the waverers. ‘Afa-gayrAllaahi ‘abtagii hakamanw-wa Huwal-laziii ‘anzala ‘ilay-kumul-Kitaaba mufas-salaa. Wallaziina ‘aatayNaa-humul-Kitaaba ya’-lamuuna ‘annahuu munaz-zalum-mir-Rabbika bil-haqqi falaa takuunanna minal-mumtariin. ‘Abtagii – (I shall seek), origin of this word is ‘abtagaa’. Bagii means “to seek for, to ask for, to desire”. ‘Abtagaa’ means “to search or seek, to explore, to want”. Hakamun – (a Judge), it has been derived from Hukam. Hakamun means “judge, Muhammadan Magistrate, arbitrator”. ‘Al-mumtariin – (the waverers, the doubters). It is plural of the subject “mumtarii”, origin of which is ‘imtiraarun and made from miryatun. Miryatun mean “doubt”. It has been described in the previous verses that there are many devils in the world, who mislead the human beings, and they use to try to entrap the inconsiderate people in their net by falsely praised talks. And maximum people, who do not believe in the life of the Hereafter, come into their temptation. The Prophets and the Messengers (peace be upon Them) bear always trouble from those people. The last Messenger of Allah Almighty, Muhammad (grace, glory, blessings and peace be upon Him) had also business with those human like devils and His followers will have to deal with them too. Those people, who seek the truth, should not lose their consciousness after being caught in their grip, and see this verse that what lesson it is teaching them to face such condition. That way of consideration is a Panacea for the religious safety and guidance of the mankind, which has been described to the Messenger of Allah Almighty (grace, glory, blessings and peace be upon Him) in this verse. It is commanded: O Muhammad (grace, glory, blessings and peace be upon Him)! You should declare it openly: Can anyone be a judge among us and the stupid people except Allah Almighty, Who has revealed this Holy Scripture i.e. Noble Qur’aan for the guidance of the human being and He has related entire useful matters very clearly and with brilliant opening? I cannot choose any other for a judge leaving Allah Almighty. He is commanding Me (grace, glory, blessings and peace be upon Him) that all ancient people, who were given the Scripture, know very well that this last Scripture has brought quite correct and true commands from your Lord. There should be never any doubt in its Truth. And that the hearts of those who believe not in the Hereafter may incline thereto, and that they may take pleasure therein, and that they may earn what they are earning. Wa li-tas-gaaa ‘ilayhi ‘af-‘idatul-laziina laa yu’-minuuna bil- ‘Aakhirati wa li-yar-zawhu wa li-yaqtarifuu maa hum-muqtarifuun. Tas-gaaa – (may incline), this word has been derived from sagwun, which means “to lean, to incline, to turn). Yaqtarifuu – (may earn), its origin is ‘iqtaraaf, which has come out from the word Qarfun. Qarfun means to earn. Here, the aim from the word ‘iqtaraaf is “bad earning”. The subject of this word is Muqtarif; that is to say, the person who earns (the earner). Muqtarifuun is plural of this word. It was mentioned in the previous lesson that in the world, where there are good people, there are bad also. The bad people have tried always to oppose the good people and they abstain never from their wicked deeds, and their wishes prevent them from observing the Straight Path. They listen never to the speech of good people. Their sign is that they desire the relish immediately and do not think about the consequence. 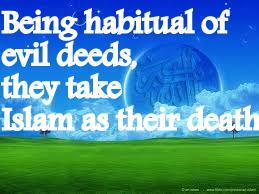 If someone says them: Your wicked deeds will destroy you in future, they become enemy of him. Their conversation is hollow. There is nothing inside them, but only apparent shape is bright and glittering as the people deceive others by covering the bad and decayed things with bright shining, and they give them these bad things and take from them their good things. 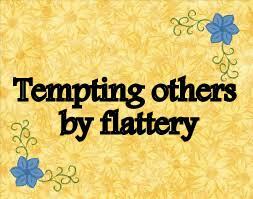 It has been described in this verse that they tempt the other people by their flattery. Their aim from showing this lie and gilding as making it true is that their group may increase and the people may become their companions by liking their conversation, and then they may carry on their crazy and destructive deeds all together. There should be none to abuse or dis-agree them. But they are able to do their authority upon those people only, who take it that “this world is everything”. They deny quite that the Day of Resurrection will come after death, and there, every person will have to account of every act and deed done during the stay in this world. And every evildoer/sinner will have to be punished properly. Now think deeply into this verse. It is commanded: These people seduce others by making their false and untrue matters charming, so that the hearts of those people, who are stupid, indiscreet and don’t believe, may incline towards them and they may begin to like their conversation and deeds, and then all of them may engage in diabolical acts, suffer in the acts of indecency, shut speaking of the good people and achieve every of their own purpose. Those people have been exposed in this verse to view. And likewise have We appointed unto every Prophet an adversary – devils of humankind and jinn who inspire in one another plausible discourse through guile. And if thy Lord willed, they would not do so; so leave them alone with their devising. WA kazaalika ja-‘alNaa li-kulli Na-biyyin ‘aduw-wan- sha-yaa-tiinal -‘insi wal-jinni yuuhii ba’zuhum ‘ilaa ba’-zin zukh-rufal-qawli guruuraa. Wa law shaaa-‘a Rabbuka maa fa-‘aluuhu fazarhum wa maa yaftaruun. Yuuhii – (to inspire), it is from the word ‘iihaa (resembling tense in gram) which has been derived from wahii. It means “to tell or teach someone about any matter using any source. Moreover, it can be used for “an indication” also. Here, the meaning of wahii has been used in literal sense, not in the term’s sense. Zukh-ruf – (guile, glittering, apparently shiny), anything, which is in fact bad internally, but that has been plated with gold or silver coating etc. Guruur – (to mislead, to deceive), to hand over someone any glittered spoiled thing, literal meanings of Guruur is imposture, cheat. Therefore, the person, who has fallen into self-deception, is known as Magruur “a proud”. We have described earlier that Allah Almighty attributes that thing toward Himself, which happens according to the rules and regulations. That is to say; such is the style of speech: We did so. Obviously, all the rules, the regulations and their consequences have been prescribed by Him. After abiding by those rules, someone acquires guidance and someone goes astray in result. And Allah Almighty commands it as: We guided and We caused to mislead. And if We willed, neither anyone went astray and nor seduced others. The aim from these words is that if any person had not done against Our rules and regulations then We had not fixed him astray and wrongdoer. It is commanded: O Our Messenger (grace, glory, blessings and peace be upon Him)! We had gathered the wicked people around every Prophet (peace be upon Him) during their times in the same manner as have been gathered around You. They are of both types; the human being and the jinn. Their job is to teach the evil deeds to one another mutually themselves, and to be prepared every time for teasing the good people, the Prophets and the Messengers of Allah Almighty (peace be upon Them). These matters do not have any value but are only for alluring apparently. 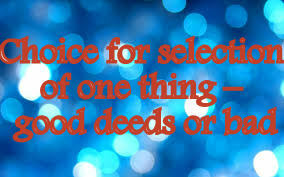 If Allah Almighty willed, He would have made everyone good and there would be none evildoer. In other words, it can be said that if Allah had employed force, none would have gone astray. But He has empowered the humankind for selection of One Way from the two i.e. the Way of Guidance or Deviation. And though We should send down the angels unto them, and the dead should speak unto them, and We should gather against them all things in array, they would not believe unless Allah so willed; but most of them are ignorant. WA LAW ‘ANNANAA nazzalNaaa ‘ilay-himul-malaaa-‘ikata wa kallamahumul-mawtaa wa hasher-Naa ‘alayhim kulla shay-‘in qubulam-maa kaanuu li-yu’-minuuu ‘illaaa ‘any-yashaaa-‘Allaaha wa laakinnaa ‘aksarahum yaj-haluun. Summary of that topic has been described in this verse, which was discussed in the previous verses. The idolaters did never desire to believe. They wished only that somehow they would have to perplex the Messenger of Allah Almighty (grace, glory, blessings and peace be upon Him) and get rid of easily by putting the entire blame on Him. It was the reason that they used to demand such Portents, which were, near to them, difficult. This matter has been caused to understand the Messenger (grace, glory, blessings and peace be upon Him) in different ways: It is not your duty to show them the strange Portents. The religion, which Noble Quran presents, is not any self-made of force religion. It is the Way, Guidance of which can be understood by the sense of human being with a little attention that certainly it is the correct Way for the goodness of the humankind. Until the knowledge of human beings was not available for their guidance, they were invited towards the correct religion by showing them the miracles. Moreover, now, while the knowledge and the science of the human beings has developed sufficiently, and there is a hope of more improvement in it in future, the sense and wisdom of the mankind can distinguish thoroughly among the good and the bad in its light, so, the people are commanded: You should think deeply according to the Guidance of Holy Quran. It will direct you towards sufficient Tokens, spread all around the world, to know the Truth. Now, there is no need of uncommon miracles for understanding the correct Religion. It is commanded: If We sent down the angels unto them, or the dead spoke unto them, or We gathered against them all ancient and forthcoming nations and things in array, even then it would not be helpful for them to understand a little about the religion. It would be taken as Allah Almighty desires to make them believers by force, whereas it is not the practice of Allah Almighty that the people should believe under compulsion. He wills that the people should embrace Islam after thinking out and understanding it very well. The Holy Quran wants to make them to understand about Islam through Proofs and arguments. There is no need of violence for this purpose. 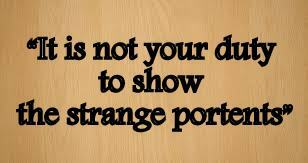 And asking for such strange Portents is useless, which are not helpful for thinking. Demanding such Tokens is only for putting off. We confound their hearts and their eyes. As they believed not therein at the first. We let them wander blindly on in their contumacy. Wa Nuqallibu ‘af-‘idatahum wa ‘absaarahum kamaa lam yu’-minuu bihiii ‘awwala mar-ratinw-wa Nazaruhum fii tug-yaa-nihim ya’-mahuun. ‘Af-‘idatan – (the hearts), this word is plural of fawaad, which means “the heart”. Ya’-mahuun – (the misled people, the contumacy, those, who do not have too much sense), it has been derived from the word ‘umyun, which means “going astray”. Allah Almighty has established the strict rules for the world and it has been running according to those rules. Nothing can get out from those principles and regulations. As those rules have been fixed by Allah Almighty, so all those projects and acts, which are accomplished in accord with those rules, Allah Almighty betroths them towards Himself. That is to say; it has been mentioned in the Holy Quran that it was done by Allah Almighty i.e. the heart of human being is influenced with many things. The thing, which has taken effect deeply once in the heart, becomes very difficult to remove it. The heart of the mankind will accept the effect of the work, whatsoever is done by him. But in the beginning, that effect will be light. 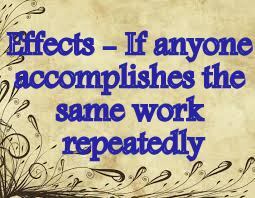 Now if that work is given up, its effect will be finished by the passing of time, whereas, if anyone accomplished the same work again, then its effect, combined with the impact will become deeper. And if it has been practiced again and again, then the effect of that object will become more and more deep. Now if that work is good, then as much this effect will be deep (by performing it again and again) will be useful, whereas if it is bad and is not left, then its bad effect will become deeper and deeper every time. And it will be as much harmful as it will be deeper. From the very beginning, the Idolaters of Makkah disbelieved and disobeyed the commands of the Messenger of Allah Almighty (grace, glory, blessings and peace be upon Him), and falsified the Revelations of Noble Quran, when it was inspired. The effect of that denial, which their hearts accepted, is called infidelity. Refusal from believing increased day by day. Different kinds of Portents were sent again and again. The Verses were being inspired for every matter, but their refusal could not be lessened. Therefore, their infidelity was increasing, even that it covered their entire heart, as it was sealed. And all it was according to that rule, “if any person accomplishes the same work again and again, then its effect on the heart will become deeper and deeper”. This rule has been prescribed by Allah Almighty. So, He commands in the Holy Quran: We sealed their hearts. It has been described in this verse: We turn their hearts and confound their eyes, because they believed not therein at the first and then they continued to deny. It is commanded: The consequence of their disbelief and perverseness at the first and then continuously, will be that, they will deny now every Verse and Portent, whichever will be inspired. And as the effect of denial has become deeper due to again and again objections, therefore, We shall confound their hearts and their eyes after sending the Portents in future. And neither they will be able to understand nor see. Now it will be their condition that their contumacy will increase day by day. Due to its effect, their hearts will be black and they will be wandering blindly.